Yahoo has acquired mobile messaging application MessageMe, a Whatsapp-like service with $11.9 million in reported outside funding. The deal, we’re hearing from multiple sources, is a talent acquisition falling into the “single-digit” millions. [Update: We’re hearing now that the deal may actually better than this. Word is the deal is actually in the double-digit millions, and has been structured to be favorable to investors and employees alike.] Yahoo is announcing the acquisition internally today, and the MessageMe team begins work Monday. MessageMe raised $10 million in Series A funding early in 2013, in a round led by ex-Mozilla CEO John Lilly of Greylock Partners. Other investors in the startup include a number of high-profile VCs, including True Ventures, First Round Capital, Google Ventures, SVAngel, Resolut.vc, Andreessen Horowitz, and Social+Capital Partnership, and other angels – many of whom also financed a prior $1.9 million seed round in March 2013. The company was largely able to raise such funds on the strength of its team and what appeared to be ever-quickening growth. Co-founders Arjun Sethi and Justin Rosenthal had extensive experience in social gaming prior to founding MessageMe. Sethi used to run an early social gaming company called LOLApps, before it merged with a publisher 6Waves. The belief was that their backgrounds would help them to better understand how to grow a product quickly and virally. MessageMe reached its first 1 million users and closed on seed funding – a sort of no-brainer for investors looking for the next breakout hit in mobile messaging. By May 2013, it hit 5 million users only 2.5 months after it debuted. But that growth was not sustainable, as it turned out. The deal will see MessageMe’s small team of 8 joining Yahoo. While we don’t know what terms made the deal favorable to employees, specifically, we’re hearing that it’s not a “fire sale,” so to speak. MessageMe still had money in the bank at the time of the deal. Despite big gains from its Alibaba stake, Yahoo’s acquisition pipeline has slowed down, we’ve also heard, so this buy doesn’t necessary signal that Yahoo is about to start picking up a large number of startups yet again. It’s possible that MessageMe’s team will be assigned to work on a mobile messaging app that Yahoo is building internally, which we’ve heard is being referred to as “Yahoo Instant.” The project has been in the works for years now, but has suffered from delays. It’s unclear if Yahoo will ever launch this app, which features Yahoo’s modern design language (similar to what’s found in Yahoo Weather), or if now MessageMe will somehow continued to be developed under Yahoo’s own brand. 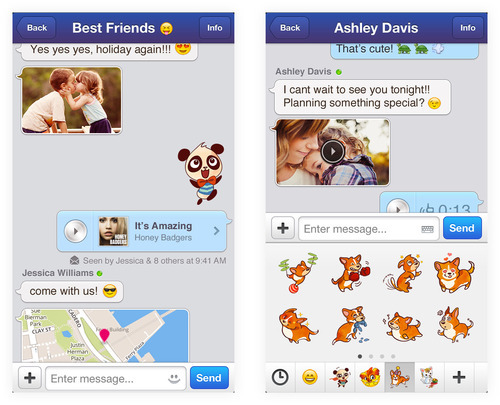 Yahoo, of course, currently has its own mobile messaging client on the market with Yahoo Messenger. But this product is a holdover from an earlier era of messaging – basically a port of its desktop IM client to mobile. The app is popular overseas in markets like Asia and India, where cell phone plans don’t include the same sorts of unlimited messaging plans that are found here in the U.S.
Yahoo Messenger isn’t popular at all in the U.S., where it’s currently ranked #566 Overall on iTunes, according to App Annie. That leaves Yahoo with a need to get its foot back in the mobile messaging market – something the MessageMe deal could aid. We’ve reached out to Yahoo for comment on this story, and will update when/if we hear back.